Justin A. Cohn | The Journal Gazette Guard Tra-Deon Hollins cuts across the Memorial Coliseum floor while Agua Caliente Clippers players hustle back on defense Monday night. 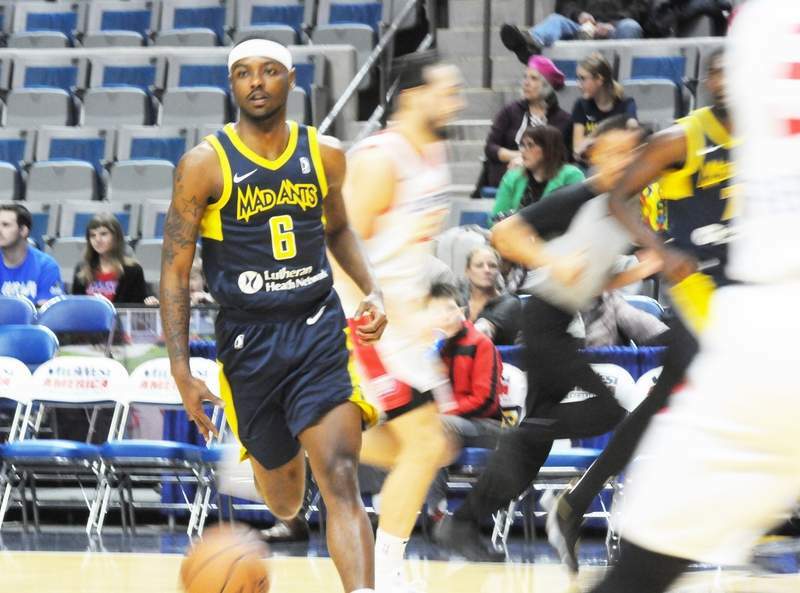 While the Mad Ants denied requests for comment about why they abruptly released Tra-Deon Hollins on Wednesday, multiple sources confirmed to The Journal Gazette today it was for a failed drug test. Hollins was second in the G League in assists (8.4) and steals (2.6), and averaged 7.2 points over 30 games this season. He was replaced in the starting lineup by Rob Gray, who had 30 points in a 121-118 victory today over the Capital City Go-Go at Memorial Coliseum. I'm told Hollins should be able to resume his career in the G League as early as this season, if he chooses to go that route, assuming another team is willing to pick him up. On a personal note, I want to say I take no joy in reporting this. But when this is one of the top players on the team, I have a duty to dig around on it. The Mad Ants could have ripped the band-aid, so to speak, and made this a one-day story, but instead they clammed up and made it a much bigger one. There were several rumors floating around the Coliseum today about what could have happened with Hollins, who was among the G League leaders in several categories. Had this been a night game, it could have been worse in that respect, in my opinion. Again, Hollins is a terrific player, and a terrific person to work with, but drug tests come with the territory for professional basketball players, and reporting news comes with the territory for me. As a point of comparison, when this happened with Chris Porter under the previous ownership group in 2015, the Mad Ants acknowledged what was going on and talked about how they were more concerned for his career than the impact it would have on the team. There were some big differences: Porter was the Mad Ants' captain; it was close to the playoffs; he had a longer history of offenses and a press release from the G League was impending, whereas the Mad Ants waived Hollins before such a statement could happen. But this speaks to different philosophies of how you deal with an off-the-court incident and the media. As for Ike Anigogu, he was released by the Indiana Pacers today. He had averaged 11.1 points. 9.5 rebounds and 1.9 shot blocks in 21 games this season with Fort Wayne. I suppose he could return to the Mad Ants if he clears waivers, but that's a sizable if.